The San Francisco Giants just can’t seem to avoid injuries. Of course, they only have themselves to blame for their latest one. Closer Hunter Strickland was placed on the 10-day DL Tuesday night with a broken finger. He suffered the injury Monday night when he punched a door after blowing a save against the Marlins. Strickland underwent surgery to treat the broken pinky finger on Tuesday. He’s expected to miss six to eight weeks. Aside from his four blown saves, Strickland has had a fine season as San Francisco’s closer. He inherited the job when Mark Melancon began the season on the DL with elbow issues. But he’s performed well in the pressure-packed role, posting a 2.84 ERA. San Francisco’s bullpen currently has the fifth-best ERA in the National League and Strickland has been a big part of that. Prior to Tuesday’s game, Strickland posted a long apology on Instagram, expressing his regret at his anger getting the best of him and hurting his team in the process. With Strickland out until at least August, Bochy looks poised to make Sam Dyson the team’s new closer. Dyson got the last two outs in Tuesday’s game, earning him his second save of the season. To this point in the season, Dyson has posted a 2.45 ERA, bouncing back well after a disastrous 2017 season. He served as San Francisco’s closer last July and August. Dyson also had a strong season as the closer for the Rangers in 2016, so he has experience in that role. Lefty Tony Watson could also get opportunities to close out games. He’s arguably been the team’s best relief pitcher this year, owning a 1.87 ERA. Melancon also returned from the DL earlier this month and has a 2.70 ERA in his first seven appearances. 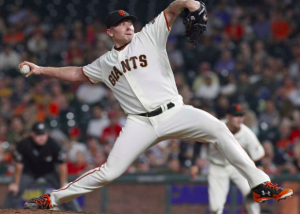 But there’s no indication that Bochy is eager to put Melancon back in the closer’s spot. Will Smith and Reyes Moronta have also had strong seasons out of the bullpen. Despite having a rather deep bullpen, losing Strickland for six to eight weeks is still a massive blow for the Giants. The fact that he hurt himself only adds insult to injury. While they are two games under .500, the Giants are just 4.5 games out of first place in the NL West. However, they need all hands on deck if they’re going to remain in contention. The loss of Strickland takes away a key player from one of San Francisco’s best strengths, which won’t help their chances of competing for a playoff spot this year.